I’m getting a bit bogged down in some of the complexities of the mediaeval Manor documents and will return to the theme when I have made some sense out of them. In the mean time we can go back 1000 years earlier. I write this at a time when the Cross Country running season (January to March) is mercifully over. I don’t know whether this is still done any more, but in the 1950s, once a week, clad only in a singlet type vest, running shorts and canvas running shoes we were sent out on this toughening experience. The course was Two-and-a-half miles for 11 year olds and Four-and-a-half for 13 and above. Our route took us up the field to Stacey Hill Farm, across the Blue Bridge with a nice downhill run beside the railway embankment to the pumping station, usually, by this time, with lumps of clay flying off our feet. I had no idea at the time (and nor did anyone else) that we were running down one of the earliest cleared fields in the Wolverton area. 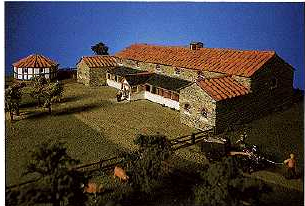 Farm buildings dating from the second century AD were first discovered in 1971. Excavations were undertaken between 1973 and 1978 with a further investigation between 1982 and 1986. The archaeological team found evidence of a south facing house 28 x 12 metres in size.The placement is entirely consistent with other villa-type farm buildings of the period. They tend to select a rather special type of site: a valley-slope facing south or east, not too high up, with shelter from the wind, exposure to the sun, and water close at hand. The archaeologists discovered limestone foundations and post holes inside the building to support the roof and interior partitions. The roof covering was probably thatch and the walls were likely to have been “wattle and daub”. The wattles were made by interleaving thin branches into a kind of lattice. Once the lattice was in place the wall was daubed with a mixture of sand, earth, straw mixed with a binder. The mixture dried quite hard and was often sealed with whitewash, It was an effective wall-making material, although it had no structural strength. The plan of this building was a large living area with two small rooms, probably for sleeping, at the west end. The north side had a corridor. Later in the second century a bath suite was added. This had two heated rooms and a cold room. The team found a cobbled farmyard and additional farm buildings and two large circular stone buildings, which were living quarters for the farm workers. Much of this is consistent with what we already know. Circular or round buildings are easier to build and roof and tend to be warmer in the winter. It is possible that each of these buildings accommodated several families. The archaeologists also found evidence of an earlier settlement on the hilltop above Brook Field which was later used as a place to cremate their dead. By the second century AD funeral customs had changed and this site was now used to bury the dead. These farmers now built a Mausoleum – an underground burial vault under a central tower some 10 metres high. This was surrounded by a verandah with columns. There may also have been a water mill beside the brook. It is probably impossible to tell how much land was farmed here, but if 200 to 300 acres had been cleared this would have been more than enough to support the farm family and their workers. I imagine they used the banks sloping down to the brook, part of what later became known as Stacey Bushes Farm. It appears that in or about AD 170 the farm was destroyed by a serious fire and that it was thereupon abandoned. The archaeologists present this as a fact but don’t explain why. And we don’t know, but we can speculate. My theory is that the destruction and abandonment of this farm may have been due to a slave revolt. Slave labour was integral to the economy of the Roman Empire and practices were no different in Britain. For most slaves the deal was food and shelter and clothing in exchange for work. With a reasonable master I suppose this was just about tolerable but situations arose where the conditions became intolerable and there were slave revolts. This may have been one such. The slaves rose up against their master, killed him and his family, burned the house and retreated into the forest and into outlawry. They may subsequently have been caught and executed. This is only a theory, but it would explain the complete abandonment of the farm for almost 100 years. Had it been an accidental fire, surely it would have been rebuilt as the survivors would have been on hand to do the work. A hundred years later another family decided to settle here and they built another house partly over the remains of the original. This house was 31 x 10 metres and built entirely of stone and had the luxury of a concrete floor. The house had three large rooms with a bath suite at the south end. In both cases advanced Roman technology was used – in the first case more obviously the baths, but in the second, in the use of concrete, stone building, mosaics and painted decoration of the walls, and an efficient heating system for the baths and the house. Scholars are revising their view about Roman settlement. At one time it was thought to be predominantly urban with villas fairly close to a major centre, but Bancroft would tend to disprove that. North Buckinghamshire remained distinctly rural until the nineteenth century and one would have to go a long distance to find a town of any size. It is more likely that these villas represented an economic model for the organization of agriculture. Whoever built the villa clearly had the resources and power to do so and there were probably a number of families engaged in and drawing their livelihood from the farm. The villa owner obviously lived in some style and directed operations and probably arranged for the produce to be sold at market – although where these markets might be we don’t yet know. How far this farm extended along the banks of Bradwell Brook can only be estimated. There are instances of villas of this period having 1000 acres under their control but 300 acres would have provided a prosperous economic unit. Given the location of Bancroft it is arguable that all or part of those south facing slopes leading to Bradwell Brook could have been cleared for cultivation. I am not sure where the name Bancroft comes from. It is from the Celtic meaning Bank Farm or Farm on the bank, but I am not aware of any historic records using this name, so I guess it is a 20th century assignment. R.G. Collingwood and J.N.L. Myers. Roman British and the English Settlements. Oxford: Clarendon Press, 1937. P. 209.